The concept is simple: A penny saved is a penny earned. The less spent on fees and expenses, the more money is available to grant to charity. That is why our cost structure for accounts of $25,000 or more is simple, consisting of two parts—investment and administrative fees—and nothing more. Qualifying accounts with ongoing balances of more than $1 million are eligible for Select status and additional benefits, including reduced administrative and investment fees, enhanced service, and a dedicated representative. Low all-in fees keep more of your charitable dollars working for the causes you care about most. An example of the fee schedule for an account with $750,000 is below. On certain occasions, we may assess additional fees on individual philanthropic accounts to cover special costs. These may include legal and professional costs, taxes, or transaction costs. When possible, fees will be communicated before being assessed. Find out more information about fees in our Policies and guidelines booklet. 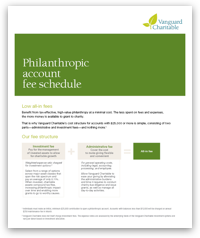 1Vanguard Charitable does not itself charge investment fees. The expense ratios are assessed by the underlying funds of the Vanguard Charitable investment options and vary per donor based on investment allocation. 2Select account status is subject to Vanguard Charitable's approval and is based on account balance, activity, and patterns. Most accounts with balances of more than $1 million for at least three months are approved for Select status. Account status is reviewed and approved on a quarterly basis. 3Weighted average expense ratio as of December 31, 2018.